HomeActions content is written or edited by an experienced chief content officer. Freelance writers submit samples of work beforehand, and submissions are reviewed and edited. Articles are also run through a copyediting site. The HomeActions system allows clients to upload articles they have written themselves, which do not go through the same vetting and editing process as the HomeActions-created content. 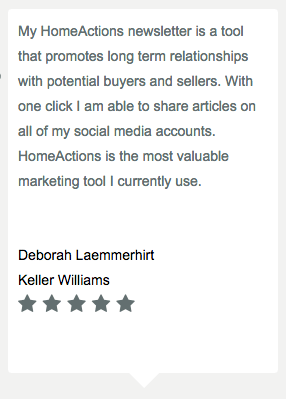 HomeActions’ “exclusivity” feature also ensures that consumers are not sent articles by more than one HomeActions client. I’ve reviewed a number of stand-alone email marketing vendors in this column. Regardless of which solution is right for you, things like interface, functionality and unique features amount to very little if you’re not consistent in your promise to deliver useful, original material. The industry is riddled with terabytes of real estate information that’s never been sent to homebuyers and sellers. HomeActions aims to solve that never-sent content dilemma by providing and sending it for you. Sound interesting? Right or wrong, I often judge professionalism by the way a person communicates. More specifically, by the way they write. Before you pounce, I don’t hold people to unreasonable standards of word choice or expect email responses in iambic pentameter. When I look at an email marketing software company that markets its differentiator as a supply of original, relevant content, I expect professionalism. 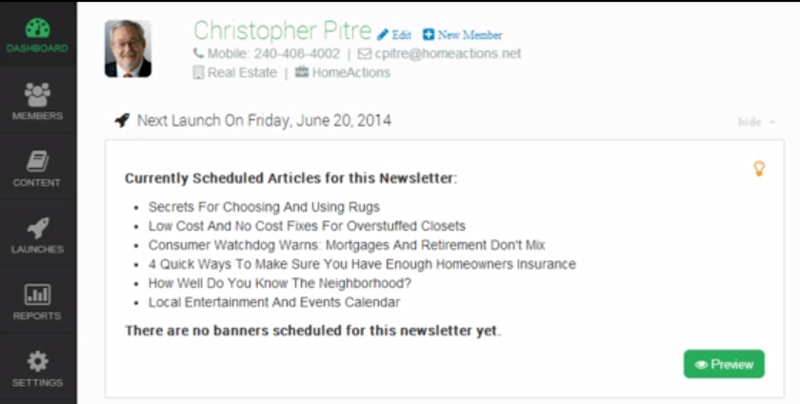 Unfortunately, HomeActions’ open rate for worthwhile newsletters is staring at zero. On the inside, however, HomeActions is great-looking software. The user dashboard is highly organized and inviting. It uses a master list of icons to navigate its feature library, and I can’t envision anyone having a hard time using it. HomeActions also has a unique workflow for building messages and adding content that’s unlike others in the industry. Instead of dragging and dropping text fields, image boxes and social media icons into a blank message template, assembling a “blast” is done by simply choosing what you want to send from a list of articles and images; users don’t see an email body or header until it’s time to preview. I love this. It puts content first and takes design away from the user. Unfortunately, whoever handles it now isn’t much better. Visually, the newsletters are dated eyesores. They also supply bland stock photos that everyone else can use, too. How’s that customized? However, I could stomach poor design if HomeActions’ primary thrust for being wasn’t that it provides content for you. But its articles are overdone, unsharable tripe. As you scan a HomeActions article, and even the company’s own Web copy, you can hear a voice that knows English well enough to tour Yellowstone National Park and understand enough to not bathe in Old Faithful, but not well enough for you to hire as a marketing copywriter. I know this because I live in the world of Internet content. 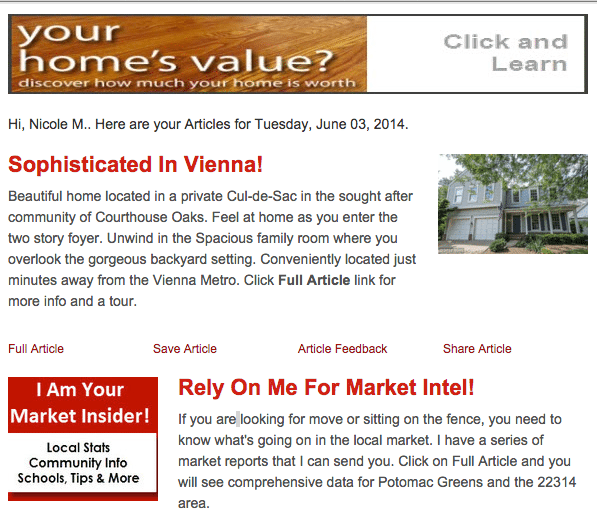 The writers at Inman compete for traffic with the type of content that HomeActions.net provides. When articles are left out of sentences, capital letters appear midsentence on nonformal terms and, most egregiously, when content is jammed with deliberately juxtaposed keywords, it’s evident that the article isn’t the work of an experienced writer. 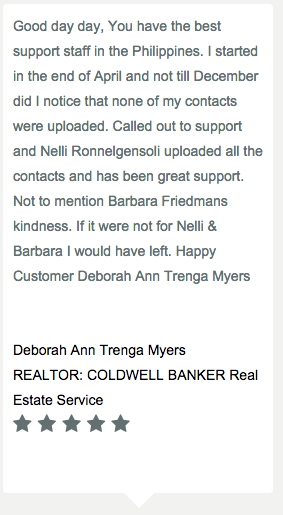 Take a minute to scroll through the quoted testimonials at the bottom of HomeActions.net, below the newsletter samples. Isn’t there a familiar tone to each? It’s almost as if the agents quoted know exactly what the search engines want to hear. There is a tremendous market for low-wage, mass-produced Internet copy, and HomeActions is doing all it can to keep it flowing on behalf of your brand. Articles like “These Deck Stains Last the Longest” and “Four Tricks to Spot Truly Eco-Friendly Furniture” are not timely or useful. Stuff like this is fatty filler, aiming for word counts. It’s the reality television of real estate. HomeActions’ other misplaced marketing message is that it promotes its measurement of opens, click-thrus and reader content interaction as revolutionary. I can’t help but wonder if the company is aware that measuring open rates is a technology almost 20 years old. All that being said, I need to stress that HomeActions really is well-programmed, streamlined software. Email addresses are easy to import; in fact, the company can do it for you. Relative to setting up your account and preferences, the interface is as equally appealing and evident. Again, I like the HomeActions software. It’s what it sends to your clients that I think you can do without. If you have a remotely sophisticated audience, or hope to build one, don’t use HomeActions’ content. Curate and write your own. When it comes to providing content, keep in mind that you’re never quite sure how many other customers of HomeActions are leveraging the same information, or at least a very close iteration of it. I wouldn’t be beating up HomeActions.net if the content they boasted about didn’t show me multiple typos in customer-facing examples or reek of originating from a content farm, foreign or domestic. One more time: The software seemingly functions effectively and does exactly what you want email software to do. Do you use HomeActions? What do you think? Leave a comment and let us know!